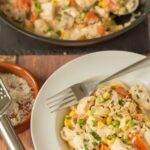 Crème fraiche tagliatelle chicken is a delicious dinner recipe. 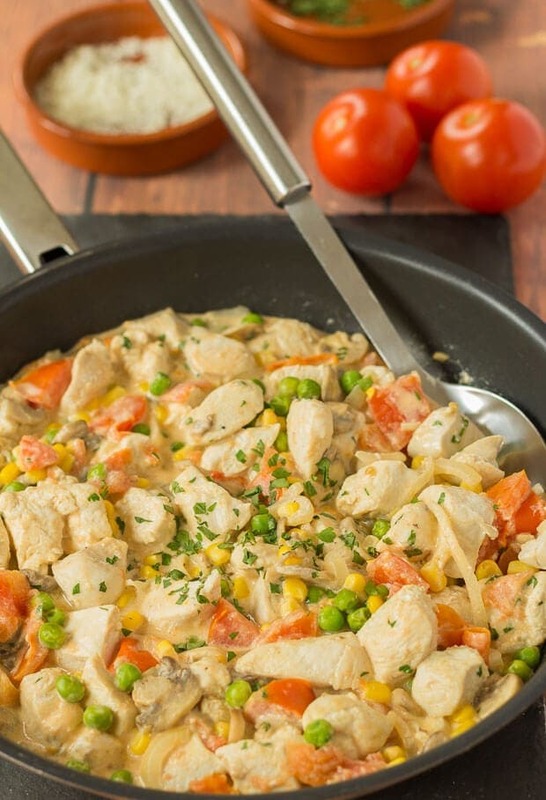 A fusion of chicken and vegetables cooked in low fat crème fraiche instead of cream. Folks this crème fraiche tagliatelle chicken is easy to make. At only 445 calories per serving it makes a perfect quick healthy midweek meal for four. It’s easy to prep for too. I think of this healthy chicken tagliatelle as one of those meals where I can get everything I need from one quick stop at the supermarket on the way home from work! 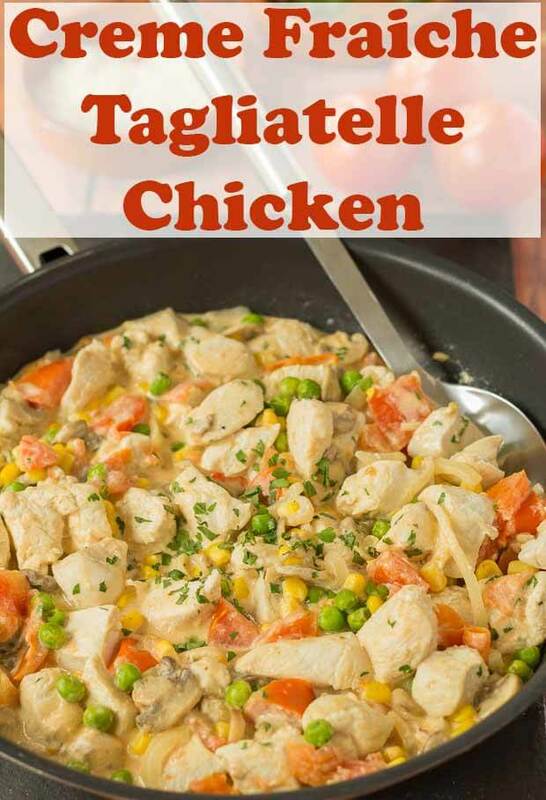 It’s great that all of the chicken and vegetables go into one pan in this recipe. You only need one other pot for the pasta. I don’t know about you, but I consider it a bonus if I’ve less washing up to do in the evenings! This meal is a time saver too. Your pasta cooks on the stove. At the same time you’re creating that rich and creamy crème fraiche sauce in which your vegetables and chicken happily simmer away in. This crème fraiche tagliatelle chicken is definitely one of those comforting recipes when only home cooking will do. A perfect end to a long day at work. It’s high in protein and provides a good assortment of your daily vitamins and minerals requirement. 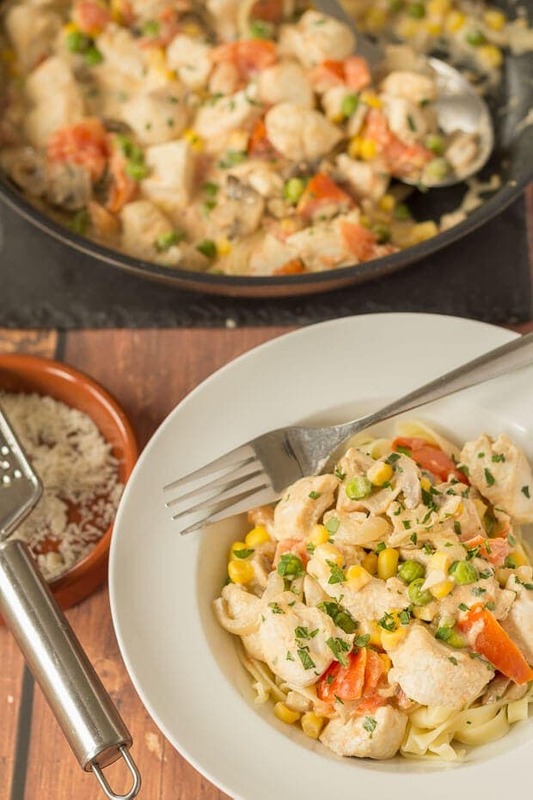 You can be sure this crème fraiche tagliatelle chicken will not only satisfy those hungry mouths but it will provide a good nutritional boost too! So that’s a delicious tagliatelle chicken dinner for you. Hope you enjoy it! And why don’t you check back on Thursday for your dessert? A cherry sponge mug cake. One that only takes 10 minutes to make! Why not try using other vegetables such as broccoli instead of the peas and sweetcorn to change the recipe up a bit? 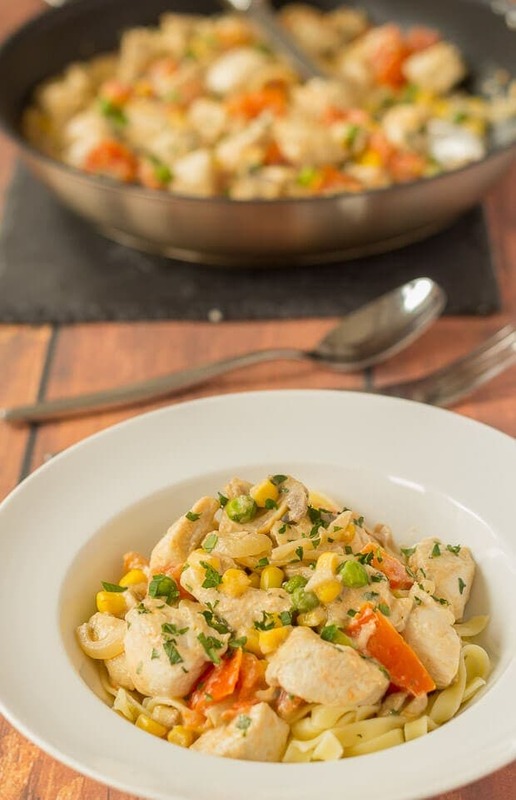 This crème fraiche tagliatelle chicken recipe is a delicious fusion of chicken and vegetables cooked in low fat crème fraiche. Heat 1 tbsp. olive oil in a large pan over a medium heat. Add the cubed chicken breasts and gently cook, stirring for about 6 – 8 minutes. Once cooked through, remove from pan and set aside. Heat the remaining olive oil in the pan and sauté the onion, mushrooms and garlic until soft for about 2 – 3 minutes. Add the chopped tomatoes and cook until soft for a further 3 – 4 minutes. Add the sweetcorn and peas mix thoroughly together and cook for about 1 minute. Add your pasta to a suitable sized saucepan, pour over the boiled water, bring to the boil and allow it to simmer whilst you finish the rest of the chicken part. Stir the crème fraiche into the vegetables and when it starts to bubble, add the chicken back, stir in the grated parmesan and a little of the chopped parsley. Allow to simmer gently for 8 – 10 minutes, stirring occasionally whilst the pasta cooks. Once the pasta is al dente, drain and divide amongst 4 serving bowls, top each equally with the crème fraiche chicken mixture. Serve garnished with a little more chopped parsley and grated parmesan if required. This looks so hearty and filling! Ha ha, brilliant, thanks Rebecca. Naturally we’d have to make this with gluten free pasta for you, but I’m sure you’d love it, and it WOULD make you feel all fancy and good too! I just love dishes that incorporate all the food groups! And this sounds so comforting as well!